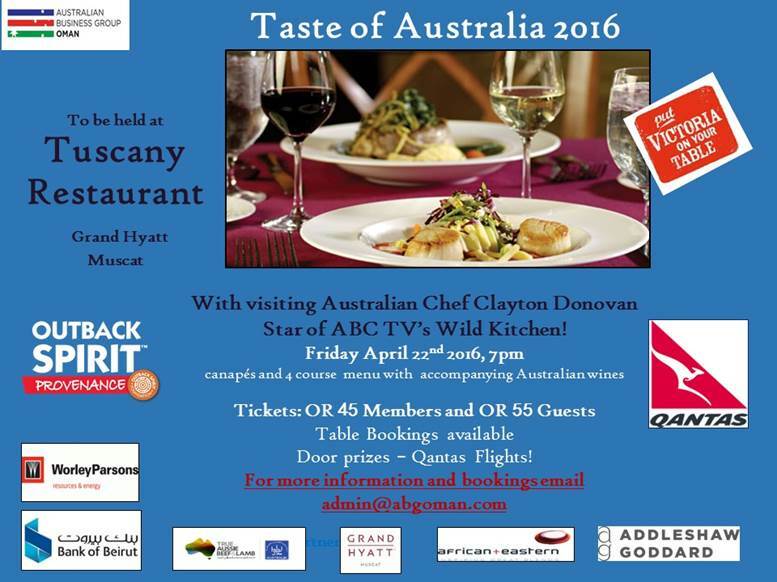 On Friday 22nd April from 7pm there is the annual Taste of Australia dinner being held once again at Tuscany in the Grand Hyatt. The Aussies are flying in Australia's "only indigenous hatted Chef" (whatever that means) Clayton Donovan, who apparently has a TV show called Wild Kitchen and is Dinky-Di at cooking. 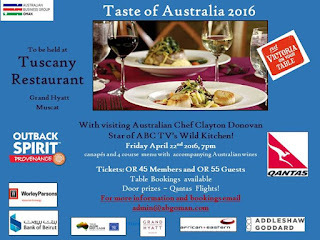 The dinner is a canapés and 4 course menu with accompanying Australian wines and tickets cost RO 45 for members, or RO 55 for non-members, and table bookings are available. I'm told that the menu is "distinctively Australian" but there will be no prawns from the barbie. I'm sure it'll be Bonzer and not Bodgy. There's a number of door prizes available, Qantas airline tickets, a mobile phone and a tablet (what type I've no idea) and a few other bits and pieces too.